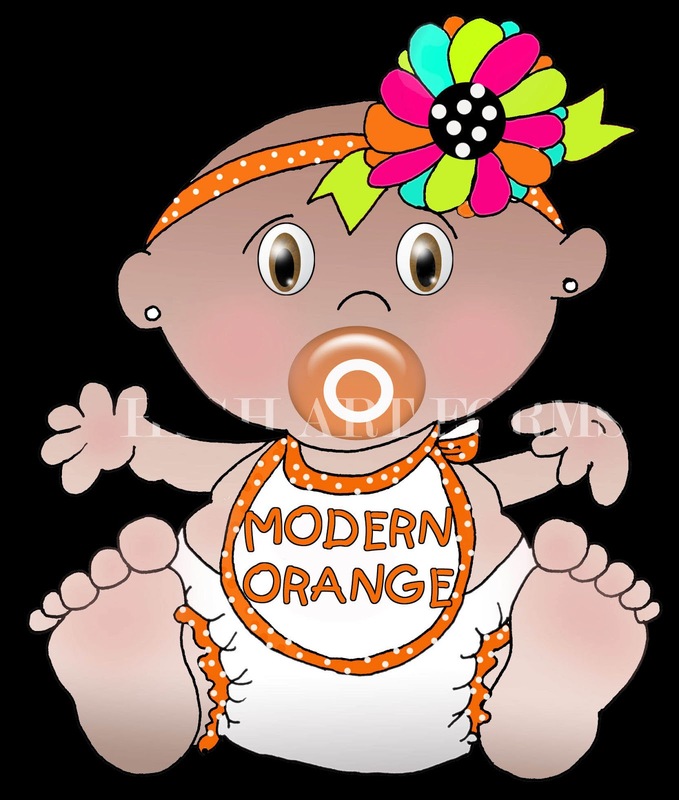 This week-end is not only Mother's Day, but the three year Anniversary of Modern Orange. I posted on someone's Face Book page that many things can change between the starting gate and the finish line. On November 11th, 2011 the love of my life and #1 fan left this world to be with the Lord. I thought of attempting to write different Anniversary Blog, but somehow this seemed more fitting. Some things bear repeating...some left-overs taste better the second time around. WELCOME BACK DEAR FRIENDS! The measure of success of any great blog is determined by the number of committed followers. Please consider following this blog and sharing with me your comments. I value your input. HAPPY BIRTHDAY TO YOU! HAPPY BIRTHDAY TO YOU! HAPPY BIRTHDAY - HAPPY BIRTHDAY! HAPPY BIRTHDAY TO YOU...MODERN ORANGE! If you are reading this blog, then for sure, you must have some idea of what an ordeal it has been to get this tiny piece of my world into yours. Believe it or not, many, many years of intercession have been necessary for this to take place. Disappointingly, my best cheer leader, my best friend, and my spiritual mentor of 23 years went home to be with the Lord on February 18th, 2010. Two days after my birthday. The only way my heart can endure the loss is to know she can pray even more fervently for my dreams linked arm in arm with HER spiritual mentor, Jesus the Christ. In the last several years of her life she confided to me that she wondered if her prayers really made any difference. I, for one, am her living proof. "What's the big deal about a blog"? This project has been a reflection of my life. It is time for this caterpillar to be transformed into God's original design - a butterfly. I am thoroughly convinced the body of the caterpillar is a disguise hiding the beautiful things to come. No one really pays attention to a caterpillar - they appear too round, too many legs, and too clumsy. A pretty absurd creature if you really think about it. But alas, deep within its heart.....the caterpillar carries a secret. As we get to know each other more intimately, I will trust you with more and more pieces of my heart, my dreams and my secrets. I was somehow fooled into believing that the most challenging years of my life were behind my husband and me. The Lord totally restored our failed marriage in 1988. We have experienced many triumphs and much heartbreak. But now, we were finally on course to fulfill the biggest dreams of our lives- the deepest desires of our hearts - relocate closer to our children and grandchildren. Not so. Several months ago the love of my life was diagnosed with breast cancer, a rare diagnosis for a man. Not only rare, but in our case, a total surprise! My husband is a big healthy man, with a big voice, big feet, a big heart, and a big call of God on his life. Needless to say...our applecart has not only been turned over, but the big fat wheels have fallen off! This past week he has undergone surgery, and as we speak, we are still awaiting test results. I WANTED TO SCREAM! WHAT'S UP WITH THIS GOD! NOT NOW! NOT EVER! DEV-U-U-G-G-H-H-H-STATED! Did I mention I was devastated? Even the high road sometimes has potholes and can become slippery when wet. The seemingly, "bullet proof and invincible " power couple that has prayed 22 years for everyone else's problems and healing , career Agents, who have filed cancer claims for multitudes of clients, were now filing their own. Few people understand the battles we have been through to still be able to put our shoes under the same bed. I have felt like an emotional yo-yo. Up - down - up - down - tied in knots. All of the promises of God, the love, prayers of family and friends, and my whacky sense of humor has been the buoy that has kept me afloat. I have laughingly compared myself to Sponge Bob in one of my favorite episodes. He starts crying and his eyes turn into sprinklers watering everything and everybody in his path. Soooo - all this to say - it has become even more important and more urgent that my husband share in the dreams he has so lovingly allowed me to pursue. Sunday night May 9th, 2010 @ 12:01 a.m. we hit the publish button for my blog, MODERN ORANGE. My prior blog rehearses all the drama pertaining to this. (which could be a blog unto itself). I nearly lost my breath! I really, really did resemble Sponge Bob more than ever! 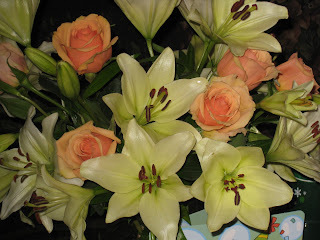 Right there in the middle of the table, next to my orange Mother's Day roses, was an adorable birthday cake, decorated with my favorite orange color, and a single burning candle. 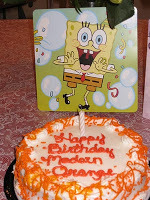 "HAPPY BIRTHDAY MODERN ORANGE", written in cursive across the top. Bobbing up and down in the air was a brightly colored "CONGRATULATIONS" mylar balloon.The balloon was attached by orange ribbon to a chilled bottle of Sparkling Grape Juice! To top it off...a musical card in almost life-size proportions was my friend, SPONGE BOB! Making a special appearance to sing HAPPY BIRTHDAY to MODERN ORANGE! I could not have said it better! 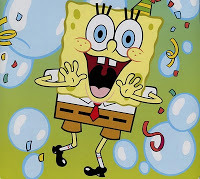 Sponge Bob ends his rendition of the happy birthday tune as only he could by singing..."THE BEST DAY EVER!". My husband and I ate birthday cake at midnight, savoring every bite. We laughed and cried all at the same time. Both of our sprinklers had been turned on! Psalm 34:8 The Message: Open your mouth and taste, open your eyes and see-how good God is. Blessed are you who run to him.